Last week, we launched Part 1 of our #HeistClub feature series. This time, we’re back with Part 2, with authors Irene Recio, Jee Ann Guibone, Georgette S. Gonzales and Ana Valenzuela of What We Fear who share with us their personal fears and the challenges and importance of writing crime stories. Irene: My love for reading started with Nancy Drew and The Hardy Boys. I loved how these books would take me on different adventures. I like watching police procedurals on TV and guessing who did the crime. 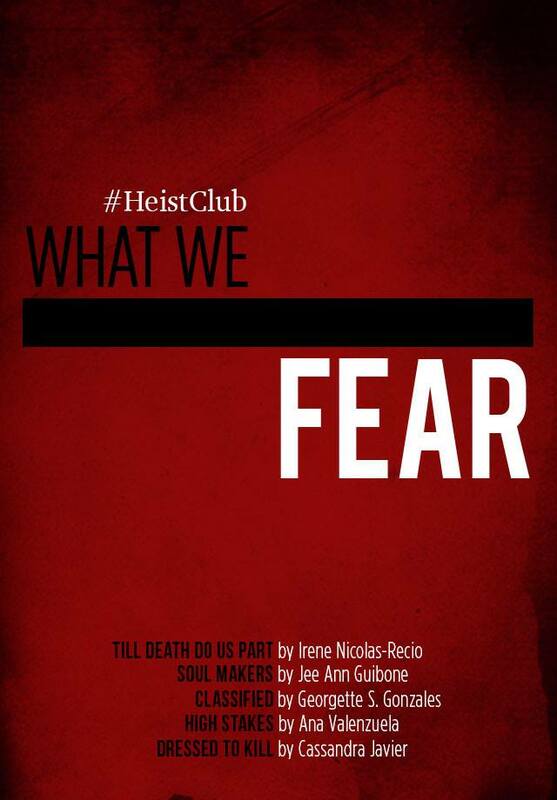 I love how women are now portrayed as strong, independent, and capable, veering away from damsels that need “saving.” I wanted to be able to do [all] this as well, and #HeistClub gave all of us this platform where we could create characters to our liking. I wanted to write about strong, independent, and capable women who are also vulnerable and human and smart and clever all at the same time. Jee Ann: I’ve always liked watching “CSI,” and then I moved on to “Criminal Minds,” because it dealt more with abnormal psychology. Like many people, I was fascinated and terrified of how dark and cruel people can be. Also, writing about crime and people who solve it is a way to face the darkness and purge the anger I always feel whenever I learn about perpetrators who escape justice. And who doesn’t love a good mystery? As a crime fictionist, I need to think like a criminal, so I know how I can get away with the crime; think like a law enforcement officer (or whoever is the crime-solver), so I know how to discover (and write down) clues; think like a victim or survivor, so I can hook the empathy of the reader. And the research! I love the research crime fiction involves. Ana: Initially, it was the challenge brought about by Mina V. Esguerra. I’ve never written anything crime-related even though I enjoy books, shows, and films that are about this. Plus, there is so much investigative thriller in every popular series, like Sweet Valley and even Archie comics. What were the challenges in writing in this genre? What did you discover about your writing skills/style? Irene: Writing crime was fun, but being a full-time mom, it was hard (and scary) sometimes to get deep into the dark side and suddenly switch back to high-energy positivity that motherhood requires when your little one calls to mommy to show her colorful artwork. It’s funny thinking about it now, but it was like going into schizophrenic mode constantly switching from character to real life back and forth! Also, even if I’m such a big fan of police procedurals and crime fiction, I tend to veer away from the gore and carnage that most crime stories offer. It was hard and nerve-wracking to do research on violence and motivations and imbibe that kind of mental state. Another challenge I realized in writing in this genre was that it would awaken the deepest, darkest fears I have. Being a wife and mother, my fears go beyond my own already. I fear more for my family’s safety and well-being at all times. And writing about it can be stressful and exacting. Jee Ann: Because crime fiction isn’t as mainstream in Philippine literature as say, romance, I found myself with too much freedom—freedom in a way that there wasn’t really an unwritten set of rules on the crime genre, and so I had to find my own way and learn as I wrote about the kind of crime I wanted to portray, how dark the story should get, or if it would be police procedural in mood. Thankfully, we had great help from crime fiction and suspense thriller writers like F.H. Batacan and Jennifer Hillier who mentored us during #HeistClub. Georgette: At this point in my writing career, I would consider the time given us to finish our stories as the biggest challenge. I started writing Tagalog romance in 2003, then in 2009, wrote my first novella with a soldier for a hero and an NBI agent for a heroine, which led me to discover that I had a knack for crime (and the military trope). It has become a genre that I feel confident writing because I have learned to enjoy the complication and details of the genre from research to writing. Ana: I really enjoyed writing and reading crime. Apart from the research, I think the challenge is for me to come up with scenes wherein the reader will not say, ‘dapat kasi ganito ginawa, dapat ganyan,‘ unless it’s a red herring or the character was really meant to do that. Deciding on the details, the timeline and what the characters would divulge are just some of the challenges [in writing crime fiction]. The devil is truly in the details, not only in writing but every aspect of life as well. How do you think crime fiction in print form is faring among Filipino readers? Irene: Admittedly, there aren’t a lot of crime fiction by Filipino authors today. But that’s not to say that people are not interested. More and more Filipino readers are hungry for intelligent and clever material. That is why #HeistClub was such a wonderful platform that gave readers and writers alike the chance to experiment and create something new, something different. And what’s good about this genre being at its early stages locally is that there is a lot of room for growth and development. Jee Ann: It’s going to be a bit new to have so many crime fiction at once (from #HeistClub), but I know many Filipino readers who would love to read crime stories set in the Philippines, featuring Filipino characters, depicting Filipino lives. Georgette: I think there is a sizeable group of Filipino readers who love Filipino crime fiction but as a sub-genre of romance. Fans of Precious Hearts’ Arielle and Camilla, and My Special Valentine’s Elise Estrella, and even of my own works as Edith Joaquin, come to mind. Readers of crime fiction in its pure form are out there, too, but I think the genre is not very popular among local writers, not for lack of a market, but because it has been easier to write romance (considering traditional publishing opportunities, which is still what many writers aim for despite the rise in opportunities in indie publishing). Ana: If it is written by a foreign author, then I have to say that the market here is great. However, for Filipino authors, it seems to be picking up. I hope it is not only because I am surrounded by people who support Pinoy writers, but because Filipino readers have embraced this genre. Why is it important to write and read Filipino crime fiction? Irene: I think crime fic is not just for entertainment and pleasure. It has a lot to do with it, yes, I guess that’s why we all love books as much as we do. It can transport us to mysterious and thrilling worlds and situations. It gives us that excitement and rush of adrenaline we crave for sometimes. But it can also be used to inform people. As they say, iba na ang panahon ngayon. It can keep us informed and help us be wary of people. Jee Ann: Because there are people who want to read Filipino crime fiction. It doesn’t usually have the spotlight in genre fiction, but people are actually interested in it. Georgette: In the aspect of reading, I would advocate for Filipinos to read more from Filipino authors regardless of genre and language. I had been one of so many who only read works by foreign authors because I believed those were far superior than those written by local counterparts until I ventured into the Tagalog romance genre. There is so much Filipino authors can offer and I feel it is unfortunate that many of us are biased against Filipino work, more especially Filipino work in Philippine setting, least of all written in Tagalog, because of the mistaken belief that these are not quality work simply because gawang Pilipino, at Pilipinong hindi pa nananalo ng Palanca. Aminin. Ganiyan tayo mag-isip. In the aspect of writing, [writing crime fiction is] important because there is a market for it, both local and international. Ana: You watch The Mentalist, CSI and other foreign police procedural shows wherein they tell you that the first 48 hours is crucial. I talked to a retired police officer and he said that it take[s] months to get the DNA results. Reading Filipino crime fiction gives us a perspective of how different the police here works. We already know there is something wrong with the system, but what are we doing about it? News and media outlets give us a glance, but there is much more to it than being getting caught and being sentenced to prison. And lastly, just to bring it back to the bundle title, what are your biggest fears in life? Irene: My biggest fears in life are not for myself, but for those closest to me—my family. There’s something about an imminent threat to the safety of your loved ones that can make you do just about anything to protect them. I started watching Criminal Minds a long time ago and had to stop. The situations just hit too close to home and it would drive me crazy thinking of what-ifs. Jee Ann: I have a lot of fears. As someone who watches and read crime fiction, I tend to be vigilant and maybe paranoid about safety and precautions. I also have fears and doubts about my own dreams and ambitions, but relevant to the crime fiction genre, I would say I am afraid of people becoming indifferent to crime. With so much news about criminals not being brought to justice, who wouldn’t be jaded? Also, we see and hear about people who get robbed or killed in broad daylight, with no one stepping in to help. That is a great fear of mine—that people become apathetic and indifferent to the needs of others. Georgette: As a writer, my biggest fear is to hear any one of my readers lament in the near or distant future how they wasted so much of their time reading my stuff and wonder whatever were they thinking believing I was a good fictionist. In real life, I fear losing my parents. I wouldn’t know what to do without them. Ana: It will have to be the future: what will happen tomorrow, what will happen in the next year, and the years after that. However, we shouldn’t spend all our days worrying about this, the best we can do is prepare. Live your life the way you want it to be and never let your fears get the best of you. Irene: Sigh. So many. But this crime fiction comes to mind right now: Six Years by Harlan Coben. Jee Ann: Gah! That is so difficult! The Harry Potter series, definitely. But also The Count of Monte Cristo by Alexander Dumas, which is an amazing tale of secrecy and revenge. The Dark Half by Stephen King is amazing. It’s not a whodunit, but it’s dark and very human. Georgette: Off the top of my head, Neverwhere and American Gods by Neil Gaiman, the Dark-Hunter series by Sherrilyn Kenyon, Until Forever and the Sentinel series released by Bookware Publishing. Ana: It has to be the book I am reading, whatever it might be. Jee Ann: Aside from J.K. Rowling, it’s Stephen King. His stories show the horrible and terrifying side of people, yet he also portrays characters who don’t lose hope, characters who fight against evil, because they believe there is goodness in the world that’s worth protecting. Georgette: Again, off the top of my head: Neil Gaiman, Sherrilyn Kenyon, Nora Roberts, Judith McNaught, Sharon Sala, Susan Isaacs, Carla Giopaolo/Angel Bautista and Elise Estrella. Ana: Can I say I don’t have one? But Cara McKenna and Mina V. Esguerra (as I have read so many of their books) have to be the top romance authors in my list. Like many others, I also admire J.K. Rowling. George R.R. Martin is the only author on my Google news feed as I am waiting for his next book. Awesome! Thanks for this Bookbed & Allana!